Just a Girl: One down, one to go! In my earlier birthday posts, I have made it clear that birthday parties around here are a lot of work. I promised myself and my husband that "this year, I'm cutting back". I had five guests tell me that this was the biggest party we've ever thrown. Huh...what happened in the cutting back process? Well, here is the official "Indiana Jones" party. It all starts with the cake, right? I went a little old school, and decided to go back to Raiders of the Lost Arc where Indy's running from the boulder. I finished baking the cake at 11:30 the night before and by 11:33 it was eaten by the Nemesis! I'M NOT JOKING! What you see is the second cake I baked. I hadn't frosted it yet, but I was furious! I hate him. Here's Indy...comin' at ya! I had my son pick some leaves from trees outside. I hope no one dies of any poisoning. Here I am lighting the birthday cake. Can't you tell? We're all sooooo excited in this picture! Good lord, it looks like we're about to cut the cake at a funeral. Games. I hate them. Apparently, so do the victims..errr...volunteers. 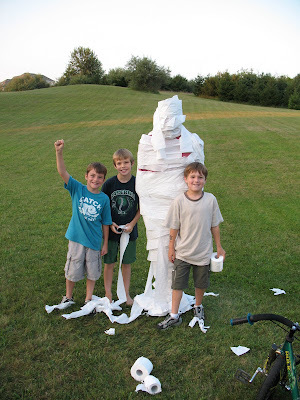 We "mummified" four adults with toilet paper. The kids loved it. 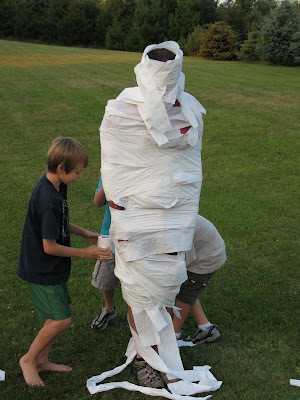 They had a certain amount of time (in small teams) to wrap their adult with as much paper as possible. 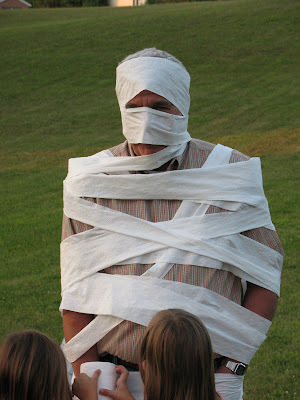 Isn't my father-in-law a good sport? How cute do those little girls look? They were giggling the whole time--I just loved it! Somehow, the birthday boy and his teammates had a system down, and they were the winning team. Others complained the judging was rigged. I think not. Next up? The disgusting archeological dig. Remember the monkey brains from...uh...the second movie? Nothing like a little cold spaghetti to gross 'em out. 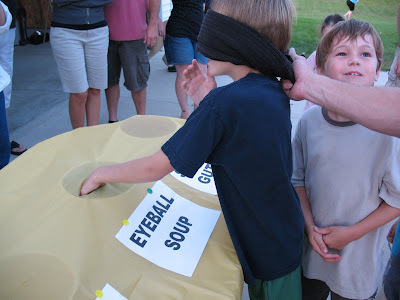 We also had eyeball soup (grapes in water) and snake guts (jell-o). We buried little plastic bugs and snakes ("it had to be snakes") for them to dig for. 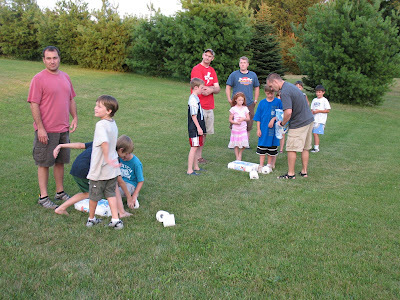 And finally, my husband lined up the kids, gave them some "potion" A.k.a. Mt. Dew--might as well be potion, and told them that if they don't find the anectdote, the boys will turn into girls and the girls will turn into boys! You should have heard the screams! 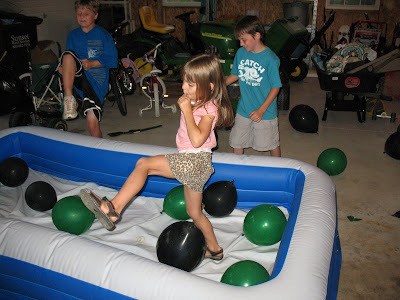 They had to jump into our blow up pool filled with ballons and pop them to get the vile (wax bottles filled with juice). Kids were going crazy (notice my daughter's high kick), adults were cracking up, and the Nemesis was freaking out over all the noise. 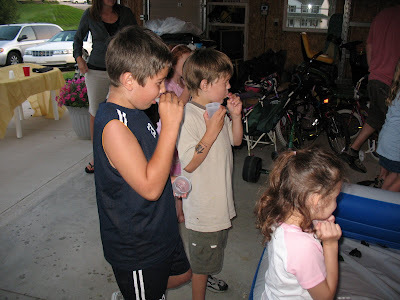 Kids couldn't chug down the juice fast enough. It was hilarious! We ended the day with tiki torces around our fire pit, a huge fire, and lots of roasted marshmallows. I ended the day with lots of Tylenol, a frozen margarita, and a very solid night's sleep. In the end, this picture makes it worth it. My husband had the camera and both of my beautiful kids are looking at me. What a priceless look on their faces, eh? Well, I hope you got some inspiration! Or, at least, a heads up that birthday parties are a lot of work! Or that you should always crate your annoying dog when you're baking a cake. doggie + birthday cake = nemesis! I too well understand this one. Great lookin' party, by the way. What a fantastic party. You are just the perfect mommy! I think I'm an okay mom until I see your blog. Your birthday parties are creative, your house is beautiful. Change your blog name to "just a perfect girl". Okay? ;-)Even Nemesis thought the cake was perfect. That sounds like an amazing party. You are doing great if you only had 5 kids. At our house, there are only 5 young kids, but the adults are coming out of the woodwork. We end up with just family totaling about 35 people. And I hate crowds! I'm allergic to kids parties, so I can't throw any for my kids. It's horrible. That is unbelieveable. The whole thing! You, my friend, are one fantastic party giver. And that cake? Amazing!! Good grief, super mom...that's cutting back. :)You are better than me with making another cake. My dog is the biggest snitcher as well and drives me crazy! My best cake was the Krispy Cream one I did. I just got the regular donuts, piled them around in the shape of a circle cake and frosted over it. So easy, fun so yummy ....but quick was the best part of it. I'm lazy with cakes. Wow! 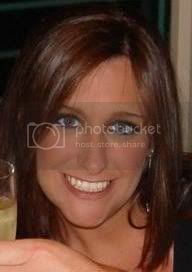 Can I hire you to plan my daughter's second birthday party in March? I am amazed (almost daily) at your creativity! Your kids are going to have some very special memories to look back on! You guys are too sweet! I certainly don't feel creative, but your encouragement helps! What a great party, and my kids aren't that little any more. Thanks for the inspiration! Wow!!! You do great birthday parties. My kids are so horribly deprived. No no nooooo...I would have been crying with exhaustion at Nemesis eating that cake so late! You poor thing!! The cake turned out incredible though and I sat here laughing out loud at your post - the funeral party, so funny. Great job on the party Chris - it looks like an amazing time for him and one your son won't soon forget! Wow! You really know how to party, don't you. That looked like a blast. OMG - your dog ate your first cake? I understand that animals are wonderful companions, but COME ON! I'd be freaking out. And my cakes are in a 9x11 inch pan...nothing fancy. Everthing about this post makes me so excited! I wish this was my birthday party!!! OMG! I can't believe your dog ate the cake! I would have been a raging you know what! You pulled it off and looks like everyone had a great time. Great ideas too! Well, my handmade, er, hand-scanned and bagged WalMart cakes are looking real bad in the face of your masterpiece right now. Super party! It takes a ton of work to pulloff such an event. Looks like it was a blast...you are very creative. I know that second cake was even better than the first! 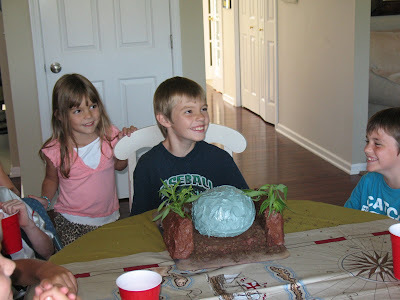 Your dog ate the first Indiana jones cake....then you made ANOTHER one???! I think we need to put you on a golden pedestal, Girl! Now that takes the cake! Hee. 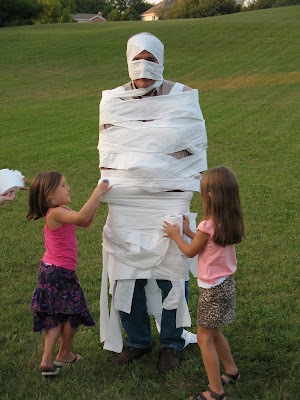 Love love love me a homeade kids birthday party, mummie games and all...Kudos!!! Are we suppose to take the cakes out of the pans? You have a sweet gift girl! 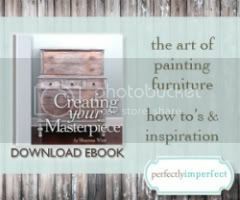 I loved your blog and look forward to reading more fun and inspiring stories! what a great birthday party! you are a wonderful mother, and I am very proud of you. your love for your children really shines through. the kids love it now, but when they become adults, they will look back with fond memories of all the nice parties you gave them. I like Maximus, but he can test the nerves. You have dealt with all that better than I would have. I really enjoyed my stay! Just getting ready to dive into my goodies I purchased. This is hysterical! What great ideas. You are very creative. Love the cake. My dog once at 3 loaves of banana bread off the counter while cooling. I know your pain. I have unusual question... I noticed your wall color in some of the pictures and I just love it. Would you mind sharing the color name for your hallway and your livingroom? What a great party! 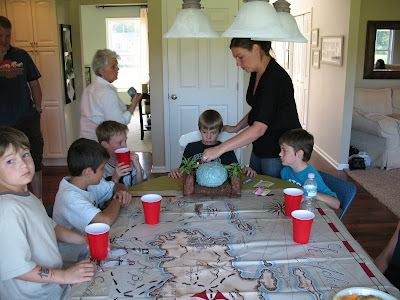 I go into creative overdrive when party planning, and yes, I also hate games. I tell myself it is to save money, but that never quite happens. All 3 of my kids have birthdays within 3 weeks of each other (2 of them are 2 days apart), so I'm pretty wiped out by the 3rd party. They love it though, and that's all that matters. Just found your blog. Just finished looking through half of your posts. Just absolutely love it! Okay, that last sentance doesn't quite flow. Anywho, seriously love your blog. You are so funny! Can I mention your blog tomorrow on my blog? Just wanted to get your permission first. No one reads my blog so it would just be for me. :) Sorry, this is a very long comment. And I saw that you are a teacher...probably an english teacher. You always throw the best parties!! I will post instructions for the lamp cord later today. Looks like it was a great party! The antidote game is so clever and sounds like a lot of fun! 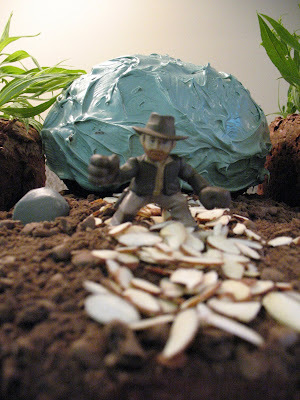 Love the shot of the Indy running from the boulder... on a cake. Love.it. I had to come and visit you because your cake is awesome! My son would LOVE that cake! Good job! WAY WAY WAY COOL!!! Thank you SO MUCH for sharing this! I am gonna have to adultify it for my husband for his 40th birthday!! Any ideas?? Visiting from Tip Junkie! What a fantastic bday party! Lucky boy! Also came over from Tip Junkie. You put a lot of work into that party and it looks like everyone had a great time. Totally awesome theme. that cake is so fun! 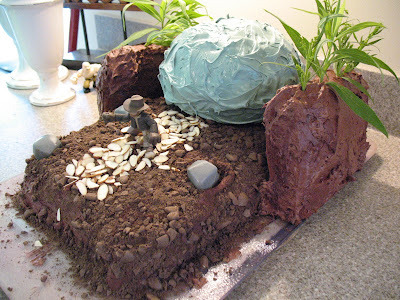 my son just decided to have a "indy" party too and i'm still deciding on how to do the cake. i always get myself into something more than i bargained for but that's the fun of it! birthdays are always big around here too, even when we cut back! and i can't believe your dog ate the first one! !